Nnimmo Bassey is an environmentalist activist and poet. He is chair of Friends of the Earth International and Executive Director of Environmental Rights Action. 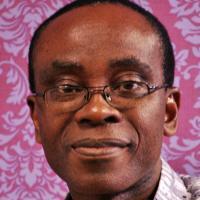 Bassey is a qualified architecturer and has practiced in the public sector for ten years. He became active on human rights issues in the 1980s as a member of the Board of Directors of Nigeria’s Civil Liberties Organisation. In 1993, he co-founded Environmental Rights Action (ERA), a Nigerian advocacy NGO, to deal with environmental human rights issues in the country. Environmental Rights Action/Friends of the Earth Nigeria Environmental Rights Action is also known as Friends of the Earth Nigeria and is the national chapter of Friends of the Earth International (FOEI), the world’s largest grassroots environmental network. In 2008, Bassey was elected Chair of Friends of the Earth International. He is one of Time magazine's Heroes of the Environment 2009. In 2010, Nnimmo Bassey was named co-winner of the Right Livelihood Award (also known Sources Friends of the Earth International/ Wikipediaas the Alternative Nobel Prize) and in 2012 he was awarded the Rafto Prize International.